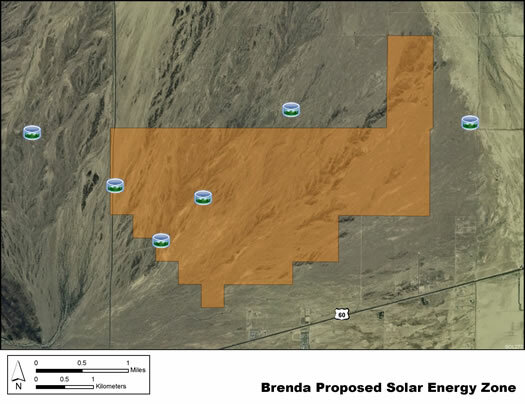 The Brenda SEZ is located in La Paz County in west-central Arizona, 32 mi (52 km) east of the California border. The SEZ is located on Ranegras Plain, bounded on the north by Bouse Hills, on the west–southwest by Plomosa Mountains and Bear Hills, and on the east by Granite Wash Mountains and Harquahala Mountains. In 2008, the county population of La Paz was 20,005, while adjacent Riverside County to the west in California had a population of 2,087,917. The nearest major road access is via U.S. 60, which runs along the southeast border of the Brenda SEZ. For the Brenda SEZ, the nearest existing transmission line is a 500-kV east–west line located about 12 mi (19 km) south of the SEZ, and there is a designated transmission corridor adjacent to the southern SEZ boundary. As of May 2012 there were no pending solar project applications within the SEZ, but there were several pending applications for solar projects that would be located within about a 25-mile (40-km) radius of the SEZ.